My Aunt Paula started making this for holiday meals a while back, and I just loved it. 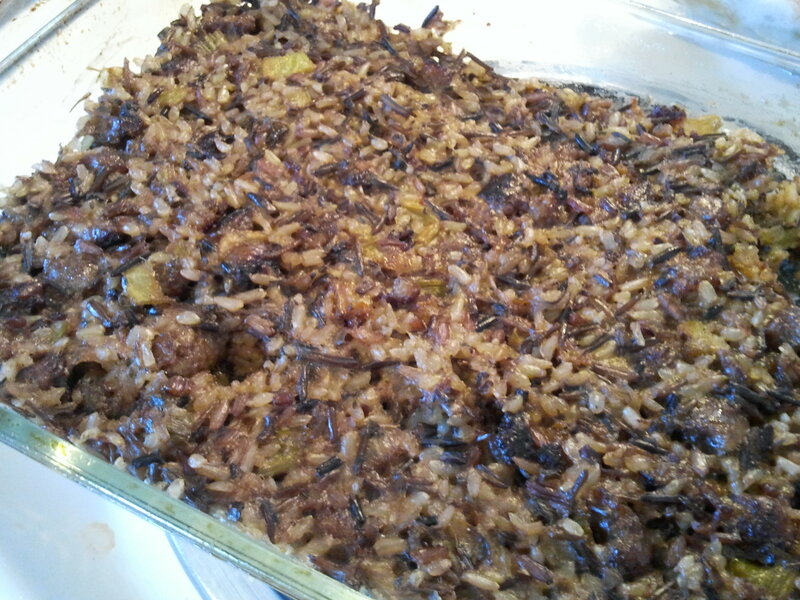 Her recipe is super simple, 1 box of Uncle Ben’s wild rice, 1 package of breakfast sausage, 1 beaten egg. Make rice according to the box, brown the sausage and crumble, mix it together with the egg, and bake at 350 F for 20 minutes. This year, I wanted to make it more into a dressing, like the traditional bread & celery dressing, and make it a gluten-free dressing, so that it could be an alternative for a Thanksgiving meal. Or, in our case, an addition to our meal. We don’t have anyone in our household that needs to eat gluten-free, but I wanted to try this out in case we need it in the future or have someone over. Put rice, water, oil or butter, parsley, and poultry seasoning in a medium sauce pan. Bring to a boil, then cover and reduce heat to simmer for amount of time on rice package directions, mine was for 50 minutes. Meanwhile, remove casings from sausage (if there are casings). Place in a large skillet, crumble, and brown. Add garlic, onion, and celery to skillet and continue cooking until onions and celery soften. Mix together rice, sausage mixture, and the egg. Pour into a greased 8×8 or 11×7 baking dish. Bake at 350 F for 20-30 minutes.